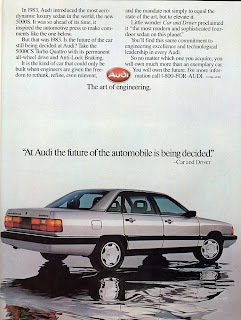 At the top of Audi’s lineup in the mid late 80s was the 3rd generation of the 100 (known as the 5000 in the States). The base model cars were reasonably equipped, roomy, front-wheel-drive only, and were powered by a 2.3 L 5-cylinder. The performance was not stellar, they’re notoriously tricky to work on for a car of their vintage, and despite pioneering the modern aerodynamic sedan look, are not terribly attention-getting stylistically speaking. That being said, I like them for their relative simplicity compared to modern cars, but a pretty decent level of refinement. They’re inexpensive to buy as well, and (if properly maintained) fairly economical. I’ve worked on them extensively over the years as well, so perhaps this has given me an un-natural fondness for the insipid Audis. It seemed like a good idea; Honda’s expertise with old-world British motoring charm. Well, it didn’t work out. 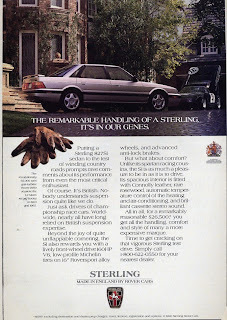 Austin-Rover’s Sterling line (they remained Rovers outside the US) sold over-ripe bananas, and unfortunately, many of the cars lasted about as long. The build quality proved to be quite horrid and despite a more sporting character than it’s Acura Legend cousin, consumers opted out. The whole line of Sterling cars sold about 35,000 units in 5 years. All that being said, they’re still an interesting oddity. If I had enough disposable income to maintain an un-loved and un-reliable Ango-Asian auto, I’d keep it around just to say I had one and preserve a little bit of history. Who knows, maybe if it ran, it’d be fun to drive. Cons: a 1980s English-made car and therefore unreliable, brand specific parts are hard to find, nobody knows what the hell it is. 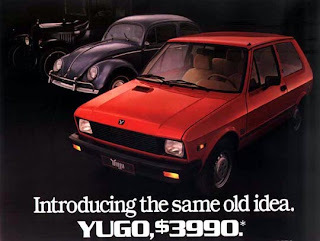 Yes, that’s right – a Yugo. Based on the Fiat 128 and built in Yugoslavia. Granted, they’re low on features, refinement, and overall quality, but I’ve heard many stories about owners maintaining them well and getting nearly 200,000 miles out of them with minimal drama. They’re cheap to buy and run, they’re economical with their small engines and manual transmissions, and they’re almost a collector’s item now… The GVX even had a 1.3 litre engine and a five speed! Another good idea gone bad (see our other article here). 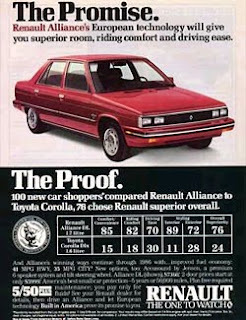 With their partnership with Renault, AMC managed to take a decent car in Europe – the Renault 9 & 11 – and crappily assemble them in Wisconsin. Like the Yugo, they have a bad reputation, but they’re so simple and easy to maintain, it’s not that big of a deal. They’re also pretty economical with a manual transmission and fairly roomy for their size. Maybe if you’re ambitious you can scrap the AMC designed American-market interior for the French one, as well as the other detail parts and you can have yourself an 11… but then it’s probably not worth it. 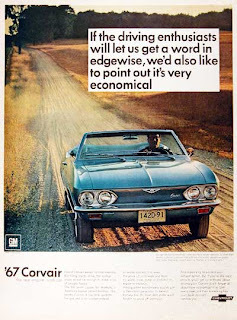 A lot of people have a special fondness for Corvairs. The VW and Porsche guys can get into them for their air-cooled flat-six mounted in the rear. The restyle in 1965 looked pretty good too and they even managed to fix some of those pesky suspension problems that Ralph Nader complained about so much. While yes, they are Chevrolets and therefore and unfortunately made by General Motors, they’re an interesting classic to have if you’re not so much of a Eurocentric auto critic as myself. They have a good following as well and maintaining one shouldn’t be very difficult. Pros: unique idea from the Americans, well styled, better than the original Corvair. Verdict: I’d probably want someone else to have one for me. Check back for future lists, including: "Cars I Don't Like and Should", "Cars I Absolutely Hate", "Best Looking Cars Ever Made" and more! I've recently acquired a set of front fenders for my 1993 Saab 900. A great E-bay find for $40. No rust, though they're cut off in the middle of the inner wheel well and re-fitting them may be tricky. Currently, they're laying in my apartment while I'm working on my never-ending college education, but some day (hopefully soon) they will be on my car and save me from the never-ending Bondo job on the current front fenders. I purchased this 1973 GTV last May. 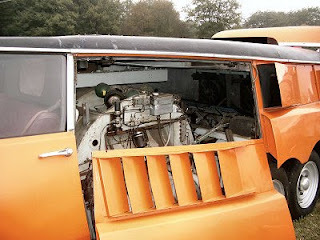 It was parked decades ago; at some point or time somebody needed a spark plug and pulled it from this car, not bothering to put anything in its place. Year after year of being left open seized the engine. Winter after winter of Utah snow left an amazing amount of rust everywhere on the car. Summer after summer of Utah heat destroyed the interior. And year after year of being left untouched in the corner of a lot turned the car into a rolling beehive. Still, it has some valuable parts on it and I'm slowly stripping it. Second is the car that's benefitting from the above, my long-term project 1966 GTV. It's slowly coming together and looking and more like a real car as opposed to a nicely-shaped piece of metal. 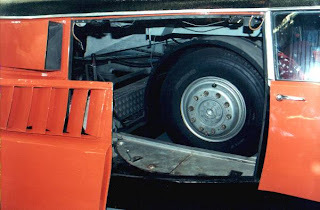 Michelin designed the PLR (Poids Lourd Rapide, or fast semi truck) in 1972 as a way to test out truck tires at high speeds without the risks of using actual trucks; if a tire blows they don't have to worry about losing control of their vehicle. 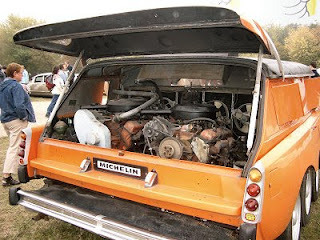 This borrows heavily from Citroen's parts bin - it was easy for them to access it since at the time Michelin owned Citroen. The ten wheels and hubs come from an HY (aka Tube) van and most will recognize the DS parts in use throughout it all. 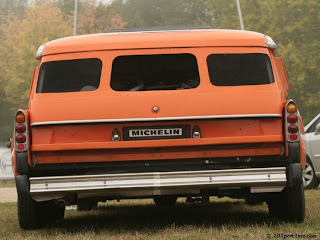 Michelin's engineers fitted two Chevrolet 350 engines in the back. One drives the car, the other drives a mid-mounted truck wheel (see below) that is fitted with a test tire. The rear six wheels power the car while the front four steer it. Nicknamed "milles-pates", or centipede, it supposedly has a top speed of 180km/h not bad for a vehicle that weighs about ten metric tons. Note: I did not take any of the above photos and do not take credit for them. 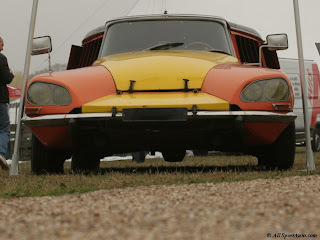 For more Citroen content click on the "Citroen" tab on the right of this page or click this link. And, have a look at our Facebook page to find photos that aren't on this site or discuss some of the cars we feature in these pages. In 1975, amidst increasingly more stringent emissions regulations, Honda introduced their CVCC “ED-1” engine. CVCC stands for Compound Vortex Controlled Combustion, a unique form of the stratified charge concept. Honda’s idea incorporated a third intake valve into the head of their engine that brought a very rich fuel-air mixture into a small chamber next to the spark plug. 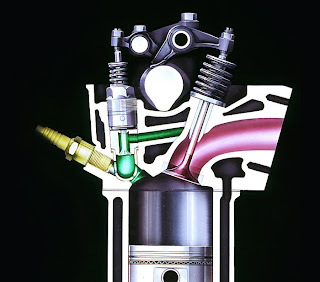 The normal, larger, intake valve allowed a leaner mixture directly into the combustion chamber. When the plug ignites the rich mixture in the extra chamber, the flame spreads outward to the combustion chamber and ignites the leaner mixture. A leaner fuel mixture generally means fewer NOx emissions but a lower power output. 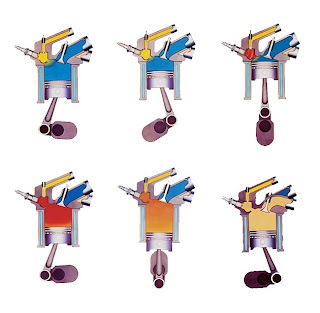 The use of the additional rich mixture allows easy ignition, and then the flame flows outward to the combustion chamber and ignites the remaining leaner fuel mixture, thus, making the most of the fuel available and reducing emissions at the same time. The original CVCC used a carburetor system with two separate venturis and two separate fuel mixtures for the separate intake valves. 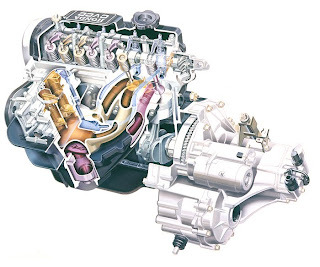 Later, CVCC technology was adapted to other engine designs from Honda and received as many as three separate carburetors in CVCC-II form before finally becoming fuel injected in EW5 series engines of the mid 1980s – though these were only sold outside of North America. In addition, CVCC Hondas eventually received catalytic converters as well, further reducing the emissions of these cars. The system faded away at the end of the 1980s and Honda began experimenting with valves again with the introduction of VTEC. But that, of course, is another story. The cycle of the CVCC engine is illustrated above. Ran When Parked is the site for unique and unappreciated vehicles. Written by three self proclaimed car-guys and updated on a semi-regular basis. We write about our own cars, cars we work on, cars we find, and the cars we meet along the way. Be sure to check out our series of reoccurring articles such as Great Automotive Failures, What Lies Beneath, Race Oddity and other editorials. You can contact us at ranwhenparked -at- hotmail -dot- com. © Ran When Parked unless otherwise noted. Photos are the property of their respective owners. Watermark theme. Powered by Blogger.